St Patrick’s Day is just around the corner, which means companies with an Irish background, large Irish workforce, or who just want an excuse to celebrate and treat their employees to some delicious new recipes. Here are some exciting alternative Irish foods you should be serving when March 17th rolls round. Guinness is synonymous with Ireland, but if you want to add some glamour to your business event, why not serve a cocktail version of the stout instead? To make Black Velvet, simply swish some sparkling wine into a champagne flute half filled with Guinness. Watch out for overflowing bubbles as you clink your glasses together this St Patrick’s Day. Most people enjoy a hearty bowl of Irish stew with traditional soda bread for Ireland’s national day. However, this can be tricky – and potentially messy – to try and eat at a work function. Instead, why not consider serving a fancy appetiser made from soda bread? Making a crostini from the oatmeal loaf would go down well, particularly if you pair it with delicious smoked salmon and flavoursome chive butter. This will be much easier for people to eat with one hand, and still count as traditional Irish fare. Sausage rolls are firm favourites at parties or work functions, as they are easy to handle and enjoyed by most people. For a classier, Irish version of the traditional bite-sized snack, you could offer black pudding sausage rolls. This Paul Hollywood recipe makes them with chestnut mushrooms, thyme leaves, red onions, sherry vinegar, sesame seeds, sausage and black pudding, so you can be sure they will taste as good as they look. Of course, every feast needs a pudding, and a bite-sized dessert that always goes down well is a macaron. 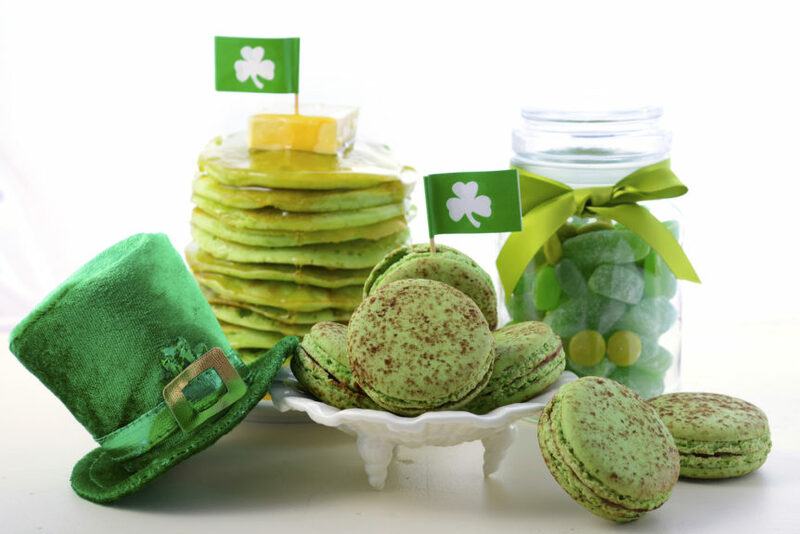 To embrace the Irish theme, you could serve shamrock macarons that are not only in the shape of the three-lobed plant – a national emblem of Ireland – but also vibrant green in colour. Really make your macarons stand out by using a Baileys Irish cream chocolate ganache in the centre for a truly indulgent pudding. You might need to order more of these than you think, as guests are bound to keep coming back for helpings. Ireland is famous for its whiskey, which makes St Patrick’s Day the perfect excuse to enjoy one of its most popular exports. Chocolate lovers will particularly love these whiskey truffles at the end of the event, and you might find the whole tray is gone before you know it. This recipe makes these delicious sweets with just five ingredients – dark chocolate, heavy cream, butter, whiskey and sea salt. Once the cream, butter and chocolate has melted, you simply need to add the remaining ingredients and whisk until it is smooth. Then after being refrigerated for two to three hours, you can scoop them into little balls and dust them with cocoa (or green sprinkles to really embrace the Irish theme!). They last for a week, but let’s be honest, with hungry staff members, they won’t see the end of the day. For caterers in Yorkshire to host your special St Patrick’s Day event, get in touch with us today.